The best way to assign campers to divisions and bunks is during the enrollment process. 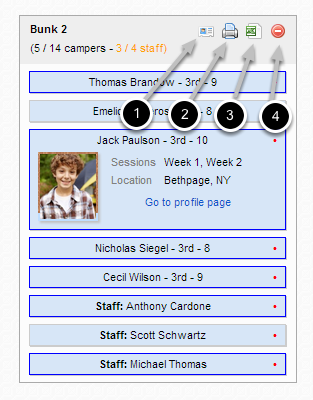 If you choose not to assign campers during enrollment, you can do so directly on the bunking board. To assign campers/staff to divisions, click "campers without divisions/staff without divisions". A pop-up will open, showing all campers without division assignments for the selected session (this is the same for staff but without the grade and age columns). 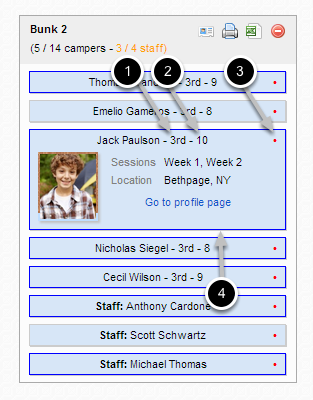 Click "Grade" or "Age" in the header to sort campers by grade or age. Select the division assignment for each camper and click "Ok" to save. Campers who have division assignments, but no bunk assignments, appear in the "No bunk assigned" section of their division. To assign a camper to a bunk, simply drag and drop their tile to a bunk. Double-click to change the division name. Click the header to hide bunk information. 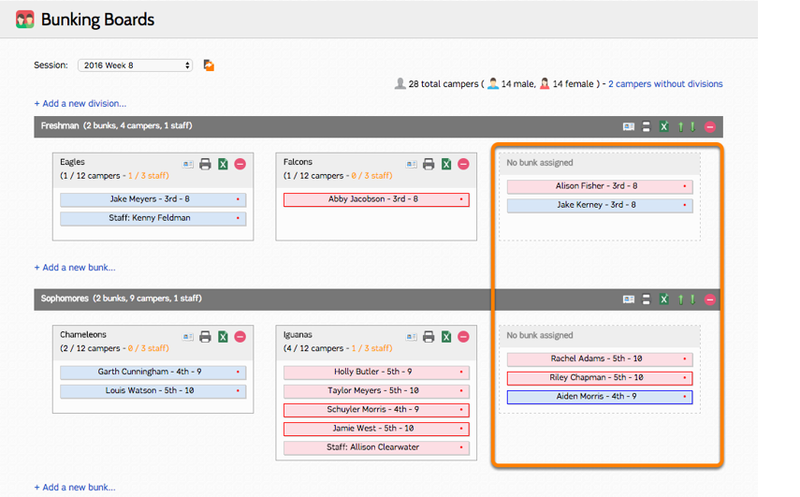 Click to toggle camper details for all bunks within the division. Click the printer icon to print a list of campers in the division with bunk assignment. Click to export the division list to Excel. Double-click the green arrows to move the division up or down the bunking board. Double-click red minus sign to delete the division. This will remove all campers from the division and bunks. 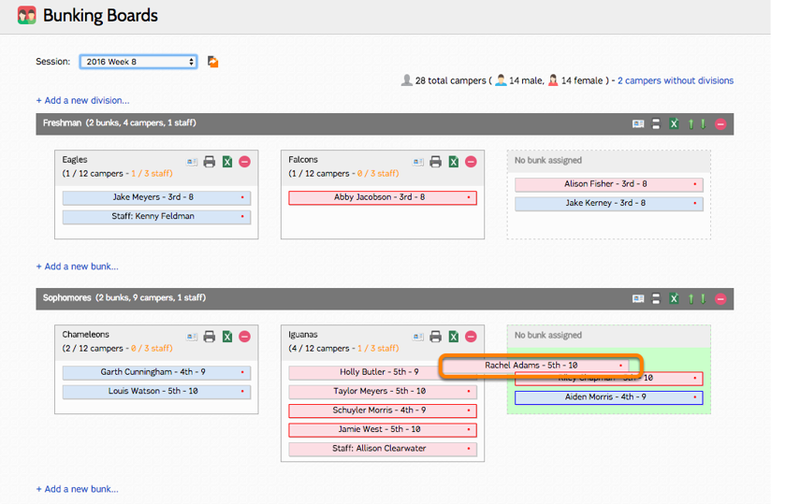 Click to toggle camper details for the individual bunk. Click the printer icon to print a list of campers in the bunk. Click to export the bunk list to Excel. Double-click the red minus sign to delete the bunk. Any campers or staff assigned to the bunk will be moved to "No bunk assigned". Clicking a camper's tile on the Bunking Board will allow you to see their individual details. The camper information displayed on the Bunking Board can be controlled through the Admin menu > Campers > Bunking Board.